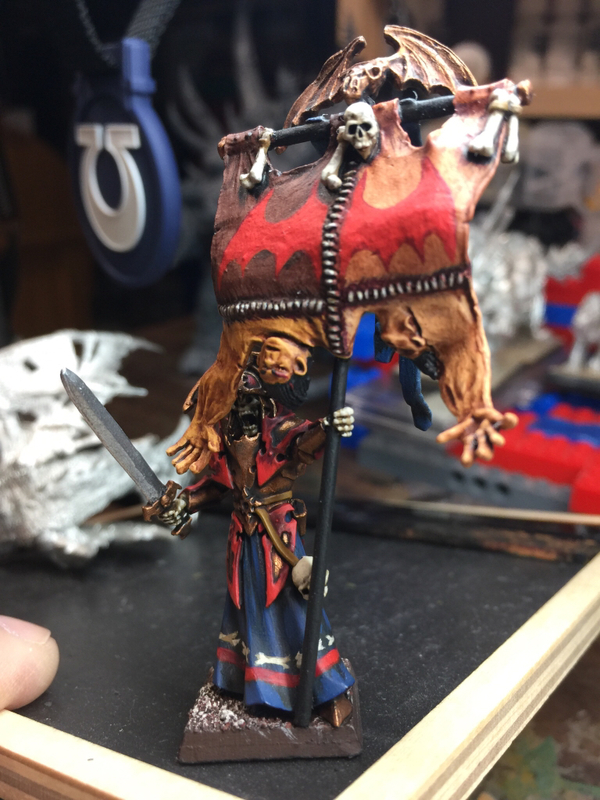 Long time lurker, but am now going to try and blog my painting adventures as well as show off my past projects. I’ll try and post an “about me” soon enough to give some background on me and my hobby saga! Suffice to say I’ve been at this a long time, since roughly 1978 or so. 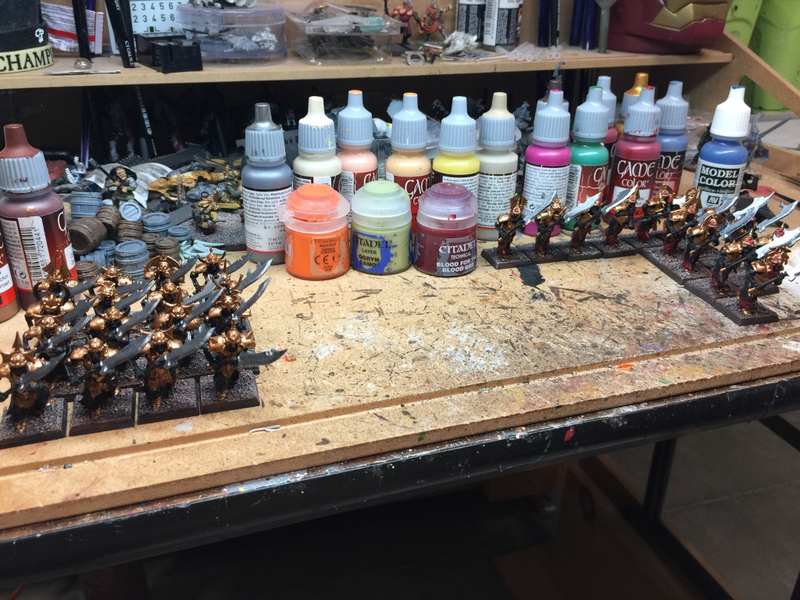 Take a couple of weeks to crank out 30 grave guard! 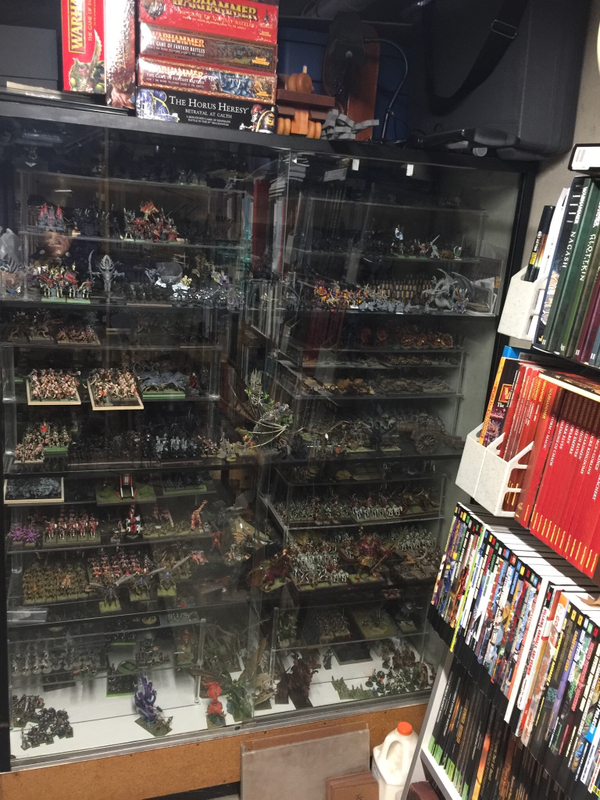 Here’s the current state of my miniatures cabinet! I have an IKEA cabinet to build that will be welcome relief, as my current cabinet is super crowded and tough to get items out!! As I organize this mess, I’ll do army shots! I am working on getting items out of storage, built and primed- to hopefully make it easy to just grab items to paint! As I mentioned, I'v been into gaming since 1978 with D&D. My first foray into GW, was White Dwarf #19!!! It was a great magazine fir D&D and other RPG's coming on to the scene. About 1984 or so, I was finally able to get my hands on Warhammer Fantasy Battle 2nd edition thru mail order (can't recall the service, it was a big mail order outfit out of Texas). That was the start of this crazy journey..... I was able to ultimately get White Dwarf from issue #107 and on too. Like most folks, I got third edition and it was super difficult to discern and really when 4th edition came out, along with the plastic skeleton regiment box, was the time I could begin an army and play a game! I found myself buying tons of minis, but not paining them as much. Back in the day before quality washes, it was a lot of work to get any quantity of minis painted. 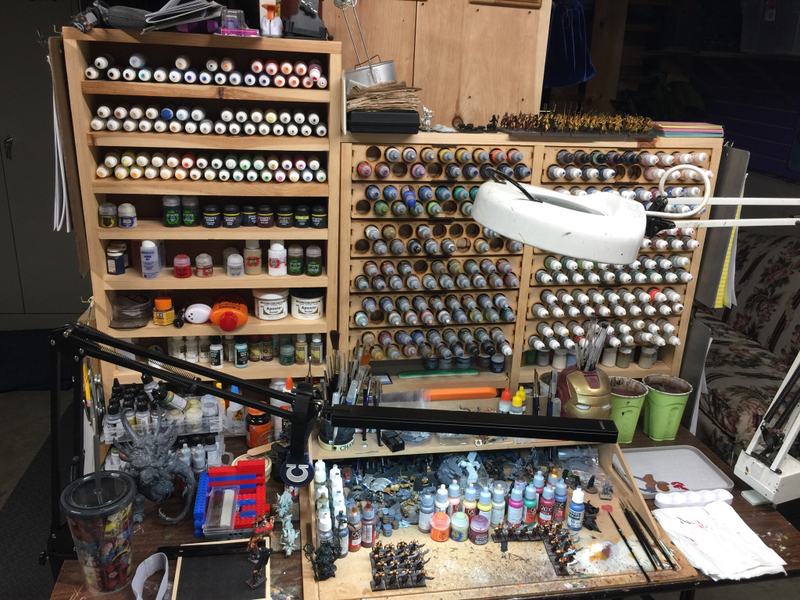 Eventually I founded my own store for 13 years (during the golden age of 94-07 for GW), and that really helped me get my paint and project management skills for army building solidified. Since my store closed, my pals and I meet on Thursdays at my place (I'll take pics of the game space later too) to play miniature games. We play a lot of WHFB (8th of course), Bolt Action, Saga, Deadman's Hand, a smatter of board/card & other miniatures games as well. That's all for now! Welcome! That looks like a proper hobby den you have there. Looking forward to some army shots. You should post in the 'where are you located' thread as well. Glad to see there are people playing out....somewhere where I am not unfortunately. Welcome! That looks like a great hobby den! Please tell me/us more about the store time of your life. How was it running a store? How was the interaction with GW over the years? Why did you close? Awesome stuff! Do I see an Antman Heroclix? And WOW! 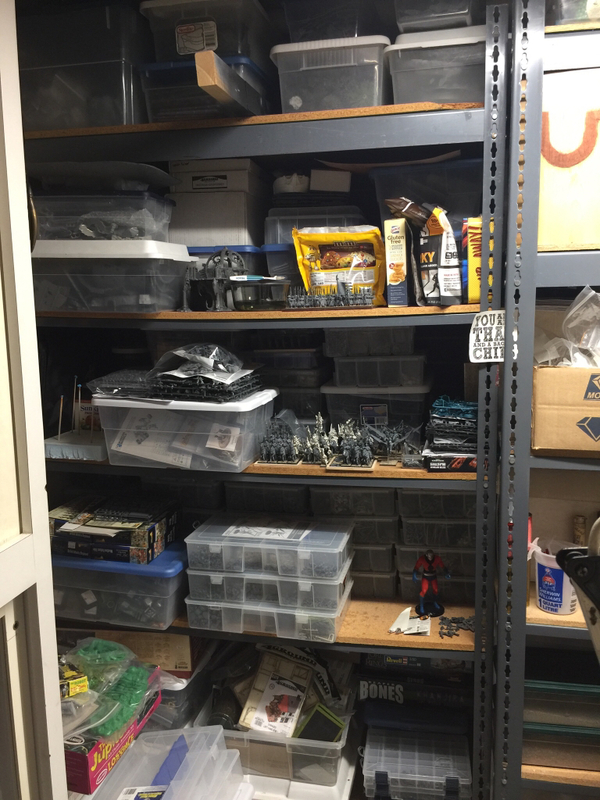 That must be a world cannon from Nuln on that middle shelf on the right! It's bigger than a dragon! Unkillable Chaos Lord....SAY HELLO TO MY LITTLE FRIEND! My armies: Empire, Dwarfs, High Elves, Wood Elves, Dark Elves, Lizardmen, Skaven, Tomb Kings, Ogre Kingdoms, Orcs and Goblins, and Skitarii (40K). Welcome and great pictures. Let me know how you find that IKEA cabinet. I've been considering it. Nice set up! Take some pics next time you play so we can see all your stuff closer up! Yes, you do see a Heroclix on the shelf!! I’ve been a comic collector since 1974, so Heroclix was a big win for me. The cannon is actually a 3-up of the 6th edition Plastic Empire cannon that was given to stores for the 20th Anniversary of Warhammer, back 2003/4 or so. Sure thing! Hope to play this Thursday, so I’ll post up something Friday or so. Just a quick pic of past painting, my Wight BSB.